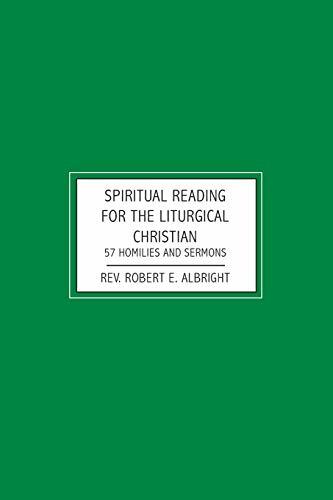 THE HOMILIES AND SERMONS IN THIS VOLUME ARE THE FRUITS OF A 35 YEAR MINISTRY OF PREACHING IN THE ROMAN CATHOLIC CHURCH. ALTHOUGH THE PREACHER AND ORIGINAL HEARERS ARE CATHOLIC, THE TOPICS AND MESSAGES CONTAINED HEREIN ARE APPROPRIATE FOR ANY CHRISTIAN AUDIENCE. THIS IS THE FOURTH OF SEVEN VOLUMES. PREVIOUS VOLUMES INCLUDED SPIRITUAL READING FOR THE AVERAGE, BIBLICAL AND ECUMENICAL CHRISTIAN. THE THREE FUTURE VOLUMES WILL INCLUDE SPIRITUAL READING FOR THE ACTIVE, CONTEMPLATIVE AND CELEBRATING CHRISTIAN.